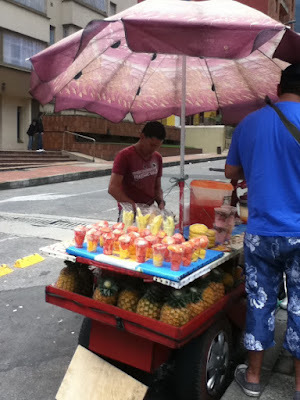 Afterwards, I went to go check out that flea market under I-95 in Lake Worth and at the same time look for the fabled Colombian fruits that I thought I had some chance of finding here. Talked to some interesting people who had no clue what I was talking about lol because I only know the Colombian words for them (lulo and maracuya). I ended up heading west past Congress after a suggestion and finally found the maracuya (passion fruit) and was so happy but still no one knew what lulo was. Eventually on wikipedia I found out that lulo is solely a Colombian word and the other word for this citrusy little fruitball is Naranjilla. So maybe on my next quest I'll ask for that lol. I ended up biking 20 miles roundtrip on Saturday which ended in my buying a small table and painting and how I had to bike the 3 miles home wobbly trying to carry it. 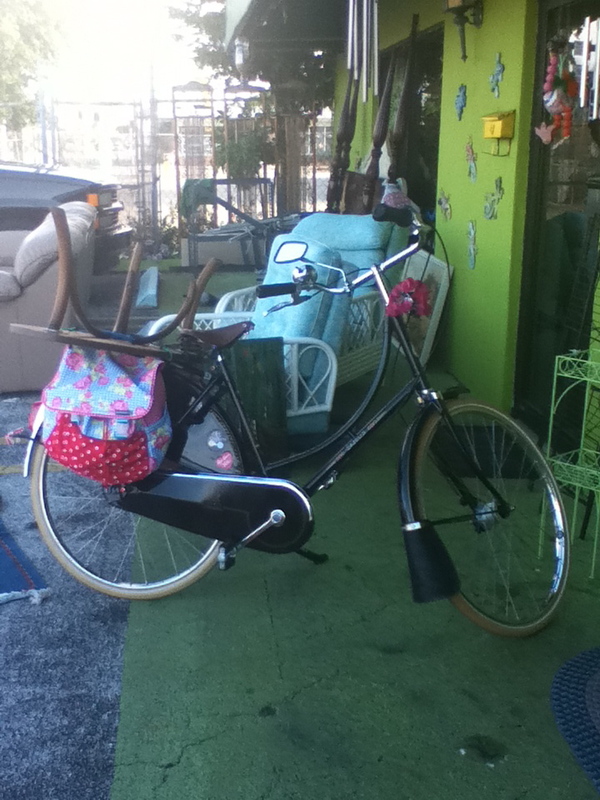 The chair strapped nicely to the rear rack but the painting had to be balanced in a bag from my handlebars and either it kept hitting my foot or the spoke or it acted as a sail in the headwind. 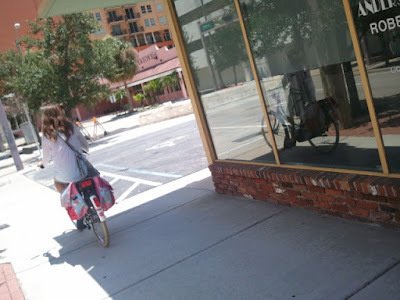 Sunday the boyfriend and I rode our folding bikes down to the Tri Rail and took it to Sheridan Street to ride down to Hollywood Beach. There is that nice boardwalk with the bike lanes and this is like the most bike friendly area in all of the South Florida Metropolitan area. What's great is that the amount of people that try to go there creates a huge backlog of traffic that we EASILY glided past. We also then did not have to try to FIND parking and then PAY for it. It was so great and only took 15 min to get there! The way back was equally amazing as we passed the traffic backlog. We used to come there by car only to get constantly frustrated. Now we will never drive there again! And lastly today, Monday, was a nice relaxing day where we took a bike ride to a burger joint where I enjoyed a nice veggie burger and he had the "Grease Beast" which had meat, fries, onion rings, grilled cheese, all etc stuffed inside this leaning tower of burger-iza. 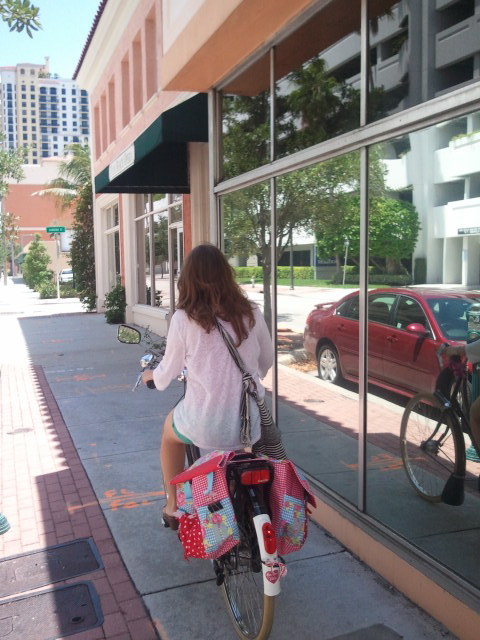 Later we had a nice bike ride down Flagler on the boardwalk. They closed off just the street portion for the Palm Beach Caribbean Jerk Festival but for a ridiculous $25 entrance fee no food included we weren't buying it. Overall really nice weekend! Hey everyone. Sorry for the long absence (where does the time fly?). I got entangled in work and then had a nice 10 day vacation to Colombia! I never thought I would ever end up in South America but there you go. I have nothing short to say of its awesomeness (for lack of better words). The food is just amazing–fresh fruit on every corner and everything is organic! It did give me some stomach issues but I'd take that over the crap we consume here. What the hell is "cheese food"? Anyways so we visited 3 cities: we first flew into Cartagena and then 3 days later flew to the capital, Bogotá. We then took an hour and a half drive through the mountain range to a city called Guateque where I was the first Russian to ever visit. This area of Colombia is located in the mountain ranges and as such, the temperatures vary. 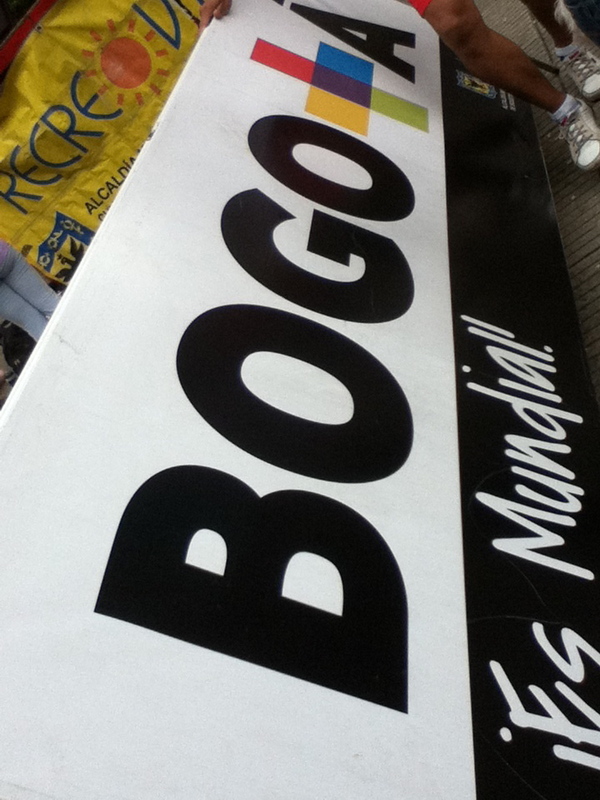 Bogotá is at 8000ft and temperatures were about 18-19C at the highest ( what is that like in the 60s in Fahrenheit?) In Guateque which is about 6000ft, the temperatures were more like 28C in the daytime so it was pretty warm. Cartagena on the other hand is right on the coast so it was much toastier and more humid and overall staying at a place with no A/C and no hot water it was more than uncomfortable and I was ready to GTFO and fly away into the mountains. Cartagena is a very beautiful city with an old Spanish fort (Castillo de San Felipe) and an old city surrounded by walls dotted with old cannons. It's a very touristy area and tourist or not, people haggle you for anything. You walk a foot closer to them and they start rattling off trying to sell you stuff. 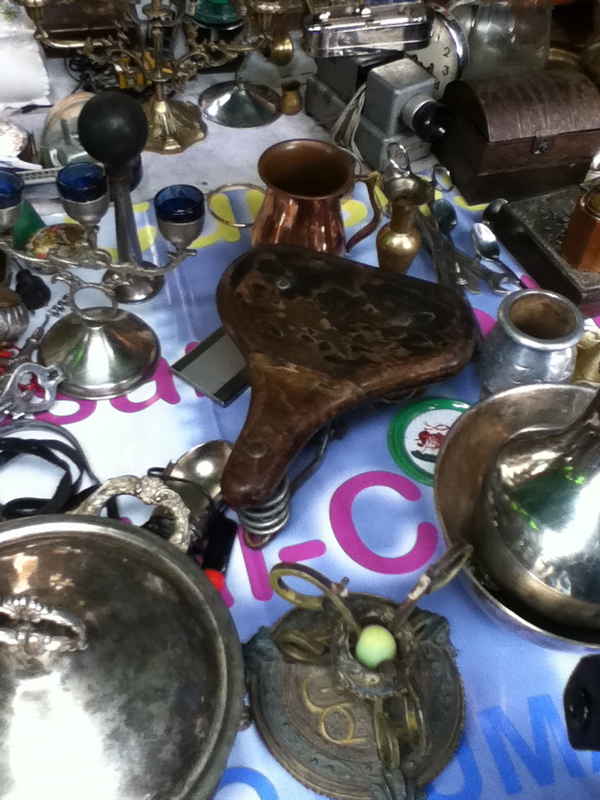 And all the stuff was the same poorly made crap but in different arrangements. We did get some "dulces" which are dried candied fruit and I am now hooked on dried papaya (called Caballito - little horse). They have lots of carriage rides but the city is pretty dusty. Cartagena smells like horse pee, food, and garbage (bags are lying around everywhere). We even managed to see 2 Batavus Old Dutch bicycles riding around but it was such a quick notice that I had no time to photograph them and it made me sad indeed :(. I believe they were either both white or one white and the other some dark colour. We took a tour on one of the traditional icons of the country–a chiva. Chiva in itself means a small female goat but they named these rickety buses that for some reason. Originally they were old trucks with a stripped down bed that they built wooden benches on and a rickety roof and they painted it wild colours. They transported farmers and peasants with all of their crapola (goats, chickens, you get the picture). Now they are like tour buses and even on a Monday, it was packed! Bogotá smells of food and car exhaust. There are 8 MILLION people jampacked into this valley and congestion became so bad that now people with cars are limited to driving certain days of the week. You still cannot escape all the smog. My boogers were BLACK. So they've also been investing in infrastructure for a bus system called Transmilenio which is pretty neat to ride on but eventually everyone is packed so tightly in this metal sardine can that if you're riding with someone, it's very possible to not be able to get through the crowd together to both get off on the stop. It rained like all week and all the statues and monuments are covered in graffiti by the unhappies. 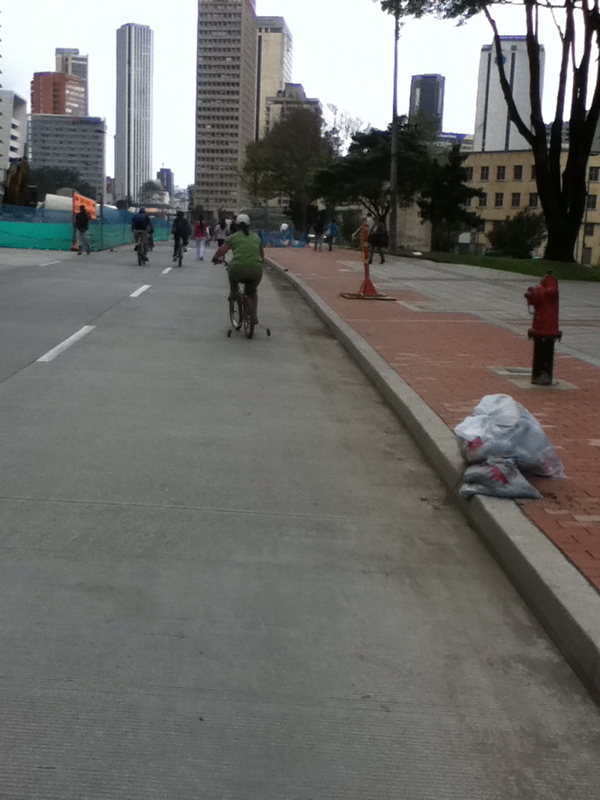 However, Bogotá has one thing the rest of the world can model: Ciclovía. This is a weekly event on Sundays and festivals that they close about 124km of the city's roads and open them to anyone who wants to take a stroll or ride their bike, with kid, with dog, whatever. The other side of the street that is open to traffic experiences major congestion. However, the closed side the air is actually BREATHABLE for once and we had a nice 4 hour walk down the road. What they lack are bike rental shops and we didn't want to go to the center of the city where some "gringo" did bike tours and was the only guy in town who rented bikes. 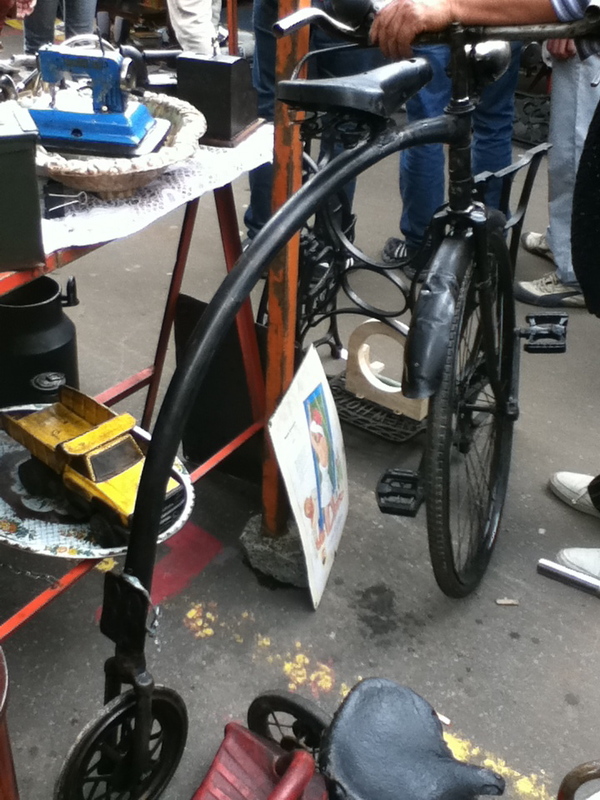 But now we have the motivation that next time we come, we will take our folding bikes with us! It really was a sight to behold. Bicycle enthusiasts come from all over the world to ride Ciclovía. 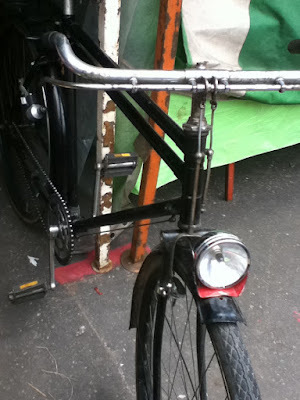 I saw one Batavus dutch bike and several vintage English bicycles, mostly with rod brakes so I figured they were old. Bogotá is at the forefront to really improve the liveability of its city because it actively WANTS to get the cars off the streets. By promoting this program, they not only encourage commuting by bicycle as a friendlier and quicker way to get around town, but imagine the enormous health benefits! They are really poised to become the Amsterdam of South America. 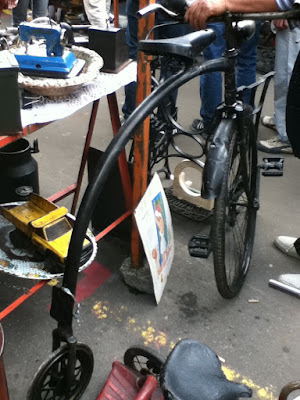 Here are some photos in all of their bicycleness splendor. Enjoy! OMG fresh fruit I miss you!! Lulo! Maracuya! Mora! Anyone is welcome here! 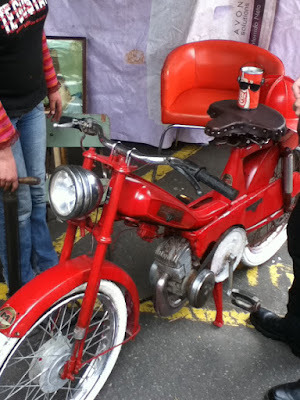 Roadies to scooters! And there were lots of folding bikes! some old motorbike WITH PEDALS!